Be happy. Anyone who asks that wants to learn. Oh, but it’s tough sometimes, isn’t it? Being a fan of silents can isolate you, even among fans of old film. I can’t tell you how many people I’ve met who call themselves fans of the classics but who’ve never seen a film made before 1930. That’s nearly 40 years of film history they’ve elected to ignore! You want to grab their shoulders and shake them. “But, but, have you seen—”, you’d sputter, your head whirling with silent classics like Metropolis, Pandora’s Box, The General, IT, The Crowd, Sunrise, Modern Times—movies demonstrating the scope, depth, eroticism, intellectualism, artistry, and beauty of silent cinema. All these films have the modern touch. In terms of character depth, subtlety of performance, complexity of camerawork—if not always aesthetic—they’re hard to distinguish from ones made a few years later. ‘We like silent films because silent films can be like this,” we seem to say. These films have something else in common too: they were all made in the last decade of the Western silent period. What about older films? What about the first thirty years of that first forty? If you call yourself a silent film fan, and you’re tempted to criticize others for ignoring what you love, ask yourself: how many silent films have you seen that were made before 1915? The pre-1915 era of silent filmmaking offered unique opportunities to the artists and craftspeople who worked in it. It was a time of flux, in which the traditions of the stage coexisted, or did battle with, the emerging grammar of filmmaking. In these early silents you can still see a push and pull between the old art form and the new—of which histrionic acting and immobile camerawork are but the most obvious examples. Just as important, and perhaps more interesting, is their mixture of realism and obvious stage fakery. This is something later directors—even later silent-film directors—did away with. But it can be intriguing. When, for example, we see a hurried man gasp in horror as he looks up at a clock with painted-on hands, what are we really seeing? What does it mean to apply to cinema the same suspension of disbelief that works so well for us when we’re watching a stage play? Are the movies a medium that requires greater internal consistency, or is it simply that movies provide it so well that we’ve come to expect it? And if the latter is true, are we missing out? Surely, as silent film fans, we’re already used to blending different media and forms into one—images and music, I mean. I find these questions worth asking, and the mixture of media, even states of reality, in these early films, to be rich and beautiful in their own right. Yet, with the exception of the short films of Georges Méliès and D.W. Griffith, the value of early silents is rarely appreciated on an artistic level. They’re shown as examples of an art form still in development. They’re described in terms of what they lack. I hope the list I’ve compiled below can help correct that. It is not meant to be comprehensive. It’s not even a list of the ‘best’ shorts and features made before 1915, though some would certainly belong on such a list. It is simply a roll call of early silent films that have always stayed with me, each link leading to a longer blog post I've written about the film. These movies exploit the malleability of an art form still gloriously free. I love them all. Imagine a photograph that could move. I don’t just mean a motion picture—I mean the content of a photograph, pulsing with the movement it would have had in real life. The greatest photographers (and painters) strive for such an effect, and you’ll see it here too, in perhaps the finest of the Lumiere Brothers’ actualités. A subversive, multi-layered composition, Washerwomen on the River could even be described as found art. Trains were big in film from the very start, thanks to shorts like The Black Diamond Express no. 1 (1896), which, we’re told, so terrified viewers with its footage of a train seemingly headed straight toward them that audience members fainted in their seats. The Black Diamond Express was a gimmick film. Arrival of a Train, made the same year, is a piece of art. Beginning with a splendidly composed arrival sequence, it goes on to show us the passengers themselves as they disembark. This must have seemed charming to viewers at the time; but today, it is a compelling glimpse into the past—something both ancient and familiar, mesmerizing us with the very rhythms of everyday life. Joan of Arc has likely been the subject of more films than any historical figure aside from Christ. 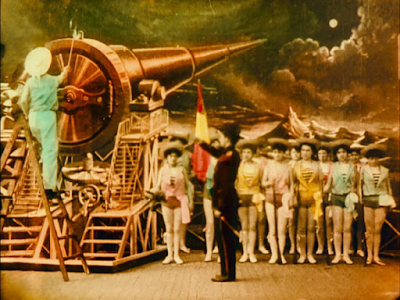 Georges Méliès, best known for his work in fantasy, delivered an early entry into this canon—an intriguing and surefooted short film that melds theatrical traditions with emerging cinematic ones. Everybody knows this one. It is Méliès’ most famous film, and a better summation of the man’s style and genius you will not find. You could make the case that A Trip to the Moon is the most influential short film of all time, or at least the most celebrated—its famed moon-shot sequence still well known after more than a century. Having inspired artists as far afield as Martin Scorsese and The Smashing Pumpkins, this film will still be talked about when the next century dawns. That famous close up: would you put it at the start of the film, or the end? Early exhibitors tried both, and that’s just one of the curiosities in this iconic early silent. The Great Train Robbery is a flawed film, but even its failings demonstrate where cinema had to go, both artistically and technologically. A masterpiece by Méliès’ Spanish counterpart, Segundo de Chomón, Modern Sculptor will have you questioning the nature of matter itself. Not bad for a short film. Based as much on the 1902 stage musical as Baum’s book, this early Oz entry cuts a manic pace. Think of the cyclone as an inspiration, as well as a plot device, and you’ll get the idea. A hard film to find, but an important one to see, J. Searle Dawley’s take on Frankenstein compliments the later versions well. The creation scene in this movie remains one of my favourites—it is both realistic and grotesque. Are we not all just bones and meat, when you get down to it? One of Mary Pickford’s darker shorts, The Dream turns a simple moral tale into a story of misperception, betrayal and abuse. Pickford married the man who played her husband in this film, and life did indeed imitate art. Watching this film is my own holiday tradition. And it’s a surreal experience. Imagine the figures in a Medieval painting coming to life—in the 1910s—and learning what matters most at Christmastime. Méliès’ longest film shows the limitations of his style, I think—but it also gifts us with the Giant of the Snows, his greatest piece of stagecraft, and an artificial monstrosity that still impresses more than a century later. D.W Griffith, a galaxy of silent stars, and in the centre of it all: Mary Pickford. The New York Hat was a prestige picture for a woman on the verge of greatness. Like Jimmy Stewart a generation later, Lillian Gish excelled at portraying controlled, genteel characters harboring colossal rage. She lets it all out in this bizarre but memorable short. His Majesty is a film in which the metaphoric is treated literally and the phony is very real. It is, in its own way, the truest evocation of the Land of Oz that I can imagine. As a fixed-camera film lasting sixty minutes, it really should drag, but it never does. Watch it with an open mind—asking yourself, all the way through, what it means to accept all these things as occupying the same reality at the same time. A wonderful tribute to early films! Melies is one of my favourite filmmakers... I love the way his world swings between the astronomer and the astrologer, science and fairy tales. Can I also suggest Gertie the Dinosaur? Not the first animated film, she is the first animated character and a brilliant example of character animation at that.